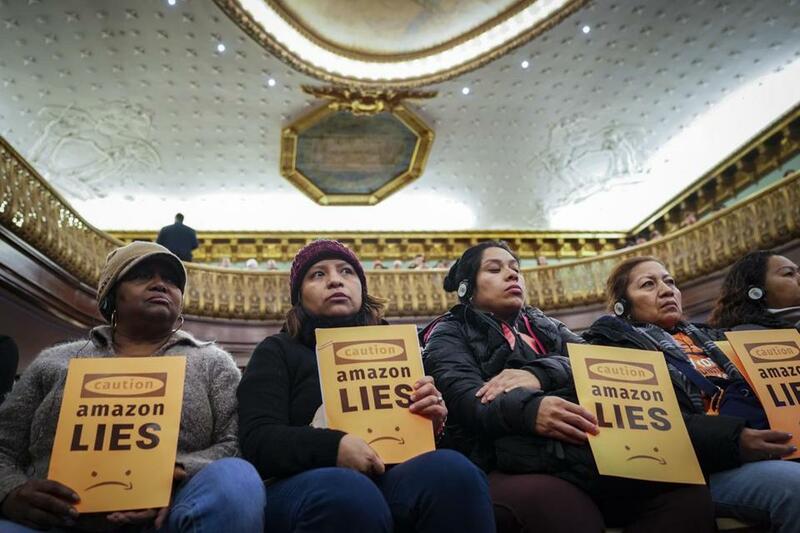 Protesters attended a New York City Council Finance Committee hearing on the new Amazon headquarters, slated to be built in Queens. The company has not leased or purchased office space for the project, making it easy to withdraw its commitment. Unlike in Virginia - where elected leaders quickly passed an incentive package for a separate headquarters facility- final approval from New York state is not expected until 2020. Tennessee officials have also embraced Amazon’s plans to bring 5,000 jobs to Nashville, which this weekapproved $15.2 million in road, sewer and other improvements related to that project. ‘‘The question is whether it’s worth it if the politicians in New York don’t want the project, especially with how people in Virginia and Nashville have been so welcoming,’’ said one person familiar with the company’s plans. The resistance in New York contrasts with the warm welcome Amazon has received in Virginia, where Gov. Ralph Northam, D, signed a law on Tuesday authorizing up to $750 million in state subsidies for the Arlington headquarters. Northam and Virginia’s other top two state officials, Lt. Gov. Justin Fairfax and Attorney General Mark Herring, all Democrats, have been engulfed in recent days by scandals involving years-old behavior. But the two people familiar with Amazon’s plans said company leadership is not concerned those controversies will hamper their project. ‘‘We always welcome more great jobs to the commonwealth,’’ said Stephen Moret, chief executive of the Virginia Economic Development Partnership and the state’s top Amazon negotiator. In a significant boost for Amazon opponents, the Senate this week nominated Gianaris to the Public Authorities Control Board, where he could effectively veto the project. Cuomo has not said whether he will accept Gianaris’s nomination, but the Senate’s action signaled that the governor and legislature will be at odds over the deal. Amazon has opposed attempts to unionize its workforce and said it would do the same in New York. ‘‘What Amazon is looking to do is come in and change the values of our city,’’ said Stuart Appelbaum, president of the Retail, Wholesale and Department Store Union. ‘‘The geography in New York has brought together a lot of threads of activism who were really ready to react to this kind of announcement and were particularly outraged,’’ said Deborah Axt, co-executive director of Make the Road, an organization of low-income immigrants and communities of color. Amazon supporters are aghast that local politicians - including Gianaris and Van Bramer - have turned against the company. In Virginia, almost all state and local leaders support the arrival of Amazon, despite opposition by several progressive groups - Tenants and Workers United, Our Revolution Arlington and some members of Indivisible Arlington - that have staged small protests at community meetings. ‘‘Most people think this is a great opportunity,’’ Board Chair Christian Dorsey, D, said. The board is pressuring Amazon to sign a project labor agreement that ensures a living wage, proper job classifications and safety standards for all those employed by construction contractors and subcontractors. Residents of the neighborhoods around the Arlington site worry about rent increases, spiking property taxes and paralyzing traffic. But neither they nor the progressive groups lobbying against the company appears to have enough political clout to block the deal. ‘‘The way these fights work, you push on each and every little thing,’’ Van Bramer said.